Everyone deserves a little luxury and to experience the finer things in life once in a while, whether it be flying in style, pampering at a spa or that dream hotel with a view. Luxury travel offers the best of the best: intimate experiences, personalized services, gourmet meals, and beautiful surroundings that together promise a vacation experience like no other with memories to last a lifetime. If you are dreaming of an extravagant getaway, then look no further, we can plan it all down to the fine details that will make a notable difference. 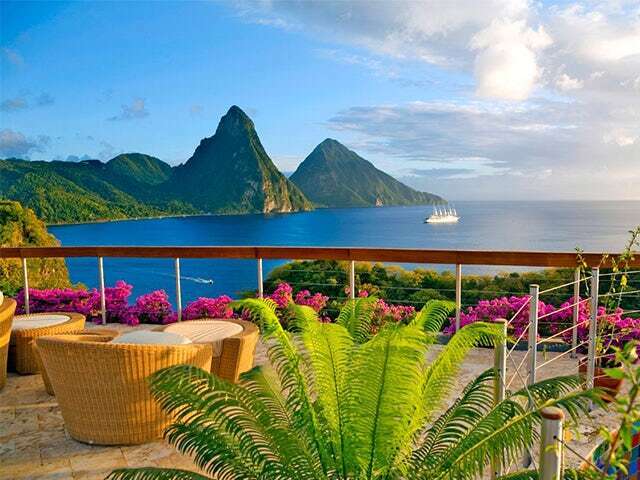 Jade Mountain Resort is a boutique luxury resort located at St. Lucia’s famed Anse Chastanet Resort. Built in harmony with Caribbean nature, the bold architectural design – individual bridges leading to exceptional infinity pool sanctuaries and rugged stoned-faced columns reaching towards the sky – makes Jade Mountain St. Lucia one of the Caribbean’s most mesmerizing resort experiences. Guests here enjoy private sanctuaries complete with their own glass-tiled infinity pools, king size four-poster beds and the services of a private butler. Expect grand sweeping spaces where bedroom, living area and an extravagant private infinity pool glide into one another to form extraordinary platforms floating out into nature. All sanctuaries feature 15ft high ceilings and with the fourth wall entirely absent, Jade Mountain’s sanctuaries are stage-like settings from which to embrace the full glory of St. Lucia’s Pitons World Heritage Site, and of course, the eternal Caribbean Sea. Surround yourself with the lap of luxury and Endless Privileges® at the award-wining Zoëtry Paraíso de la Bonita. Snuggled into the silky white sands of the Riviera Maya, this exceptional adults-only retreat centers on romance and wellness. Offering magnificent ocean views, graciously appointed suites, gourmet dining, extravagant amenities, and personalized service, this resort has been recognized as AAA Five Diamond for 15 consecutive years. Oceanfront suites feature lavish Bvlgari bath amenities, large terraces, top-quality linens and hand-appointed artwork. Gourmet restaurants are a true treat with locally grown ingredients featured throughout as well as heart healthy fare and vegetarian and gluten-free options. Activities range from included golf green fees at the 18-hole Grand Coral Riviera Maya Golf Course to cigar making, tequila & wine tasting, Temazcal ceremonies with Ancient Mayan healing practices, sunset catamaran cruises and windsurfing. Extravagance rules supreme at the Thalasso Center & Spa, which uses the health-through-water concept for the ultimate in serenity. Located on an islet facing Mount Otemanu, the InterContinental Bora Bora Resort & Thalasso Spa stands out for its modern design and its Balneotherapy & Thalassotherapy center unique in French Polynesia. With its bright and spacious overwater villas, this resort is the perfect place for couples looking to relax and rejuvenate. Step off the deck of your luxury over-water villa into the warm embrace of a tranquil lagoon. Enjoy everything from snorkelling/scuba diving to sunset cruises on the surrounding reefs, while a pristine beach and an award-winning spa invite you to relax. From weddings in the glass-bottomed chapel to candlelit dinners beneath swaying palm trees, it’s the perfect setting in which to experience the romance of the South Pacific. Grand Mirage Resort & Thalasso Bali is a five star resort with a private beach. Rising like a vision from the Balinese sea, it is located only 20 minutes from the airport, on the tip of Nusa Dua Beach, in the village of Tanjung Benoa, Bali's water sport center. It offers a whole new class of all inclusive and room & breakfast packages and includes motorized watersports in its all-inclusive packages. With a total of 301 stylish rooms and suites, Grand Mirage Resort offers 4 world class gourmet restaurants, a wide selection of activities for both adults and children, complimentary Wi-Fi, as well as a Thalasso Spa with 21 individual designed treatment rooms. • Visit northern Bali and Lovina Beach with its black sand. Admire the mountainous region and coastal landscape. • Experience the beauty of the Kintamani region. Enjoy the traditional Balinese dances and breathtaking views of Lake Batur. • Journey through the East and visit local villages and temples. • Shopping tour: Visit various markets for hand crafted souvenirs. • Enjoy the Bali sunset. Visit the temple of Mengwi and Taman Ayun. See the wild monkeys of Alas Kedaton Forest. Finally, capture the sunset at spectacular Tanah Lot. Vilamendhoo Island Resort, surrounded by a beautiful lagoon, an excellent house reef and long stretches of white, sandy beach, is the only Resort of Vilamendhoo, South Ari Atoll. It is 900 meters long by 250 meters wide, about 55 acres. Your seaplane transfer is a scenic 25 minute flight. It’s the ideal place for honeymooners, divers, beach lovers and anyone who appreciates luxury in a destination of pure beauty. Conditions apply. Valid on travel booked through UNIGLOBE Travel. All advertised prices include or disclose taxes & fees. Prices and offers are valid for new bookings only. Air only prices are per person for return travel in economy class unless otherwise stated. Package, cruise, tour, rail, hotel and car rental prices are per person, based on double occupancy for total length of stay unless otherwise stated, and are applicable for the departure date listed at the advertising deadline. Pricing that includes airfare is valid only for the departure gateway listed. Airport transfers to/from the hotel may not be included and are supplier and destination specific. Some packaged travel products for certain destinations may include flight connections at an additional cost ($). Taxes & fees due during travel or in destination are additional and may include, but not limited to, local car rental charges & taxes, one-way car rental drop fees which are to be paid upon arrival, resort fees & charges, tour ‘kitty’ or local payment, airline baggage fees, departure taxes, and cruise gratuities. Prices are for select departure dates and are accurate and subject to availability at advertising deadline, errors and omissions excepted, and subject to change without notice by the supplier. Advertising deadline: April 2, 2019. Additional terms & conditions may apply for each specific product. For full terms & conditions please speak with a UNIGLOBE Travel consultant.